Well, I've been playing Knights of the Old Republic, essentially just with Sam. It's very good, almost more than we deserve. It's considerable fun working our character into a Jedi, making a lightsabre, and flying around the galaxy. The graphics are great and the sound is even better. Hearing all the various aliens talking in their native tongue is classic Star Wars. Plus there's a great story involving ancient secrets, evil Jedi, and a desparate plan to save the galaxy. It doesn't get any better than that. Painting continued this morning. The office is completely finished, complete with switch covers and all. The main rec room and kitchen is mostly done. I put a second coat down most places, but I still have more ceiling and a few walls to do, not to mention the stairwell. It's going to be tight, as we're running low on that particular color of paint. Tomorrow is our informal painting party, though hopefully there's not much for people to do. We could do a bunch of trim and some doors, though we'll see how energetic everyone is after they arrive. As for today, it was fairly low-key. Sam was pretty beat, watching all of Toy Story and half of the sequel. I did get him on a short hike in the morning, which was nice. Still, I think our kids might be a little sick as Emma's been grumpy lately. Emma's getting increasingly active. She's quite capable of pushing herself around these days, though she rarely exerts for much more than a few inches at a time. She'll scoot over to her latest favorite chew toy - a rubber chicken. She loves to nibble on the toes, occasionally getting one toe in her mouth and another up her nose. I suppose we're bad parents from letting her play with it, but she just loves the darn' thing and I don't have the heart to take it away. Yesterday, I was a painting fiend. I think I worked for around eight hours in between the Thanksgiving gatherings. I did a single coat of paint everywhere and went to bed that night completely exhausted. This morning, the plan was to start again at the crack of dawn. Unfortunately, it was evidently Sam's plan to get up at the crack of dawn as well. I did manage to paint the office with a second coat, but the rest of the basement remains. I did have a good Thanksgiving otherwise. Jamie's family arrived bringing lots of food. Later I went over to my mom's for another big meal with the other side of the family. Today was more subdued. Mostly we hung out, Jamie cleaning and me watching kids as much as I could. The kitchen ended up sparkling with an inner light. Now it's approaching nine and time to collapse in bed. Yesterday was yet another of those that try men's souls. It began with an overflowing toilet, spending what I had hoped would be a couple leasurely hours cleaning up sewage. Immediately after that, it was off to Sam's preschool to wrangle twenty kids about. I didn't really have time to be exhausted, as the duty of parents tend to keep them endlessly busy. Finally, Jamie and Emma picked us up around noon. Sam opened his present from me - the extended version of the Two Towers - and we watched an hour or so of it. After that, it was back to watching kids and getting ready for Sam's semi-birthday party at my mom's. It was a nice gathering and Sam got a suit of armor, which he's been wearing all morning. Today I downed a couple cups of coffee and went to work on the basement, painting big sections of it. Jamie's currently taking her turn behind the roller, but I don't think she'll last very long. She thought she'd do anything other than watch kids, but it appears that painting is one of the exceptions. Isa had her first dental appointment to day - making it through with flying colors! So far there's no sight of the Jones' family gap. Go Sam, it's your birthday. Sam's five years old today, pretty amazing. This morning I'm going to his preschool to be "Outdoor Dad", whatever that means. Later tonight, we're going over to my mom's for a semi-birthday party. 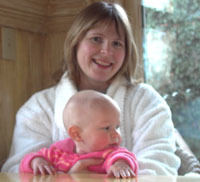 Hard to believe that it was only five years ago when we were all eating turkey in the waiting room, waiting for Sam to come into the world. As you can tell by this picture, he's clearly far for mature now - the manly jaw, the confident face - it's quite obvious. Ah, mocha Tuesday. Today's my last day of work for the week, as I've been shanghaied into helping out at the preschool tomorrow. Jamie's plan is to paint during the brief window between retexturing and getting the cabinets hung. After that, it's four days of franting painting then they put down carpet and vinyl. Can't wait. A dreary morning indeed. 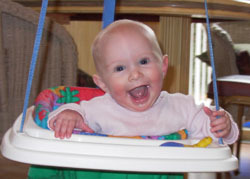 Sam woke up at six in the morning bouncing with energy. We stuck him in front of Teletubbies, which mesmerized the whole family for awhile. Emma seems much better after her digestive woes. She's getting very verbal and wiggling about on the floor. John reported that he had seen two raccoons out back. (Okay, okay, so how does one spell raccoon?) Later in the evening, he made a foray to his car, and came back to report that two deer had nearly mowed him down on his way back to the house. Almost had venison for Thanksgiving! John and Anita have been here since last Tuesday - we went on a trip up the Coast, stopping at Seaside and at Fort Clatsop, where Lewis and Clark's expedition wintered over. day, but we couldn't see the mountain. I remember the devastation along the Toutle River, the river flowing down from the mountain, when Dad, the kids and I drove up about three months after the mountain exploded. Everything was covered with a thick gray coat of pumice. Seraph, Robbie, Hanni, Isa, Anita, John and I are going to Ashland this weekend. Should be fun! Love to all - the aging mom. Holidays: Looks like the poor beach house will be empty much of December. Too much to do. Jim and I are going over for New Year's to read and relax. We're welcoming any family -- just know that New Year's day is football! It's a crazy day here at work. It seems as if everyone in the world decided to e-mail me their latest issues. Plus I got paged at 3 am this morning. Fortunately Jamie's a light sleeper, otherwise I would have snoozed through the loud beepings. Poor Emma was throwing up last night. I think it was a little too much sweet potato too fast. The poor thing looked miserable, then fell fast asleep. Jim did a super job painting over the weekend. Supposedly we get textured walls today, then a bit of painting tomorrow night and cabinets go up. By Thanksgiving, there should be tons of painting to do. Feel free to attend our painting party on Sunday. We had a great weekend full of lots of visiting! Robbie and I went out Friday night, actually staying up until mid-night listening to a band at Sam Bonds. We felt very grown-up! The Ducks managed to win the Civil War game, but the Seahawks managed to lose their 17 point, 4th quarter advantage, to the Ravens - thereby making our sports weekend a mixed bag. On Sunday Yayoe watched Isa so Robbie and I could go watch the Costume/Fashion Show at the VLT. It was great fun, and many thanks to Yayoe for sending us!! We're gearing up for the holiday weekend. I think we will try to take advantage of Anita's creative skills and get her to help set up Robbie's Christmas village. Isa has a stuffy nose, and Robbie and I are pretending we don't, so there has been fewer hours of sleep, and a little more grumpyness in our house these days. We would probably qualify for Sadie's "lump of coal" list! Let it be known that I am accepting suggestions for gift ideas, also known as wish lists. Most poeple will recieve coal and hand made paper goods, but for those of you who have no actual paper good needs must resort to listing so I can figure out how to make what you want out of glue and styrofoam. All is well and sunny, chilled but not unbearably cold here. Anna and I made tacos last night, a wonderful flashback to the days of mom, Seraph and I when we didn't have a microwave or a step father role model person. Quite tasty. Saturday seemed filled with activity, though I basically stayed at home the entire day. Sam and I played a lot of our new Star Wars game. Jamie had the luxury of sleeping in and taking a shower while we entertained Emma. Judy came to take Sam and Josh to see Elf, while we stayed at home to do laundry. Jim and the boys went to see the civil war game, then they and Jamie headed out to North Bank. Lots of juggling, it seems. The basement is coming along nicely. Jim's done a great job of painting doors and trim. Tuesday night we have to paint an area of the room in preparation for shelves, which I guess show up Wednesday. 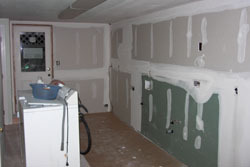 The drywall should all be finished by Thanksgiving weekend, which is the time when everything else gets painted. Our lives have been racing along at super-speed. I'm not quite sure I can catch my breath yet, though I'm looking forward to the short week next week. Sat. (11/22): post game gathering at Mom's house. The usual footbal gang, as well as anyone else who wants to come. Thanksgiving: Dinner at Mom's house Thur. around 4:30ish. I assume dinner will start around then, but (I hope) no one will complain if we show up at 2 or 3. Sam and Robbie both have birthdays coming up. Any gift ideas flooting around? Well, the remodel is coming along quite nicely. The sheetrock folks put up all the drywall. It still needs to be plastered a bit more and the walls textured, but it's getting closer. Jim arrived safe and sound yesterday and has already started on the doors and the trim. Thanksgiving plans seem to be floating around these days. It sounds like Jamie and the kids will be doing something with Brant and Ray, with a guest appearance at my mom's house. I'll be doing the opposite, spending time at my mom's and putting in a guest appearance with the Mellor side of the family. Ah, holidays and the coordination that comes with it. I'm looking forward to my Friday mocha, though it's a few hours away. I'm actually meeting a couple people for coffee around 9:30, Jonathan and Kate from back east. If I remember right, Danica mentioned they were headed to Eugene after school and didn't really have a place to stay or work to be had. They've since found an apartment and are currently looking for jobs. I suppose I'm the impromptu welcome committee. I feel I should be passing out rubber ducks and umbrellas, though I'm not really sure what constitutes symbols of our town. Well, Knights of the Old Republic was supposed to arrive today. It actually did arrive, then was taken away again by the dumb FedEx person. I guess it didn't matter that the last few games that came FedEx were left on our doorstep. This one had to be treated as something precious. So, no lightsabre battles for me tonight. Sam had to be satisfied playing a little Morrowind and having his cat character go swimming out into the depths of the ocean before he had to take a bath. He's so deprived. The only good thing I can say is that at least I'll get it on a Friday and can play it nonstop for as long as it takes. I'm sure Jamie will back me up on this one. It snowed yesterday, right after lunch. My coworkers kept looking at the window and making excited noises. Sam went out to play, but I think the cold and wet got to him after awhile. 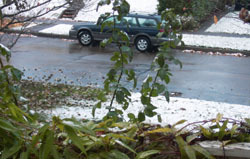 By the time I got home, it had mostly turned to slush and no one really wanted to go outside. We got ceilings yesterday, and hopefully walls today. The main floor bathroom also got new tiles put in. Sam and I tested out the bath last night, as we hadn't used that one for quite some time. There are still a couple holes in the wall that need to be patched, but everything is finally usable. Jim should be there by the time I get home, painting like a maniac. Sam and I are also looking forward to the arrival of a new computer game, Knights of the Old Republic. It's a Star Wars game and supposedly quite good, so we're pretty excited. Can't wait for the weekend. I'm already feeling the urge to take some time off. Maybe around Christmas after the basement is finished. The morning ride to work was quite exciting, the wind blowing leaves all about the road. Very picturesque. The remodel is moving slowly along. The carpenters were back yesterday, putting down a thin layer of wood in preparation for the vinyl flooring for the kitchen/laundry area. Supposedly the sheetrock folks are here today, so we'll soon get walls. Rumor has it that they're going to try to be finished with the walls and cabinets by Thanksgiving, but I'm not holding my breath. Jim should be here tomorrow to begin his painting fest, of which we are very grateful for. As the HUD requirements for the Analysis of Impediments piled up, I began to look for an easy exit from the planning internship. In an exhausted overwhelmed moment I told the director of planning that I just couldn't do it all by myself. So now I have a fellow intern picking up the easily packaged parts of my projects. She will finish up the small business interviews for the assessment project while I muck through the impediments bit. I think this will really help me organize my thoughts and time and give the projects I can't do to her. Yes! For the record, I bought my plane ticket, and Adam has graciously promised to pick me up at 10:30 on Christmas Eve. I fly out on the 31st of December- short, but hopefully very very sweet. I heard from Jenny M.S. this evening, and having been poor and isolated for five months, she's decided to apply for grad programs in creative writing- the UofO, UVA, and UNC. Kudos for her and her brave slaying of the GREs. 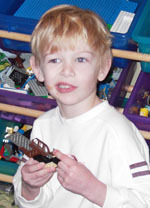 I don't usually post super-huge pictures of Sam, but this was taken at school and gives a glimpse into the reasons he might be enjoying it this year. I've been working away at fixing the problems with this site. I think the problem was with a security patch that Microsoft issued over the weekend. Like a dutiful administrator, I patched it up, only to start running into problems with this website. It turns out that it wouldn't let go of certain connections, which eventually ate up the 10 user limit and caused it to become unavailable. I rolled back to the last set of changes and it seems okay again. Here's crossing my fingers. Problems with the web site today. It kept reporting that too many users were connected. Unless I've suddenly become super-popular, I'm guessing it's something else. Still not sure what it might be yet, though obviously it's up again. Turning things off and back on again works wonders. Otherwise, it was a quiet day at work. 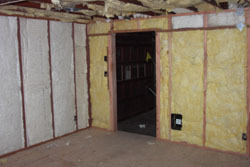 The contractors put up insulation and the sheetrockers arrive tomorrow to get the walls up and running. We might actually have some room-looking-things in a bit. Emma's getting increasingly mobile. She's able to scoot herself along on her belly for a few inches now. The rec room should be done just in time to contain her wanderings. The weekend is coming to a close, the kids in bed, my lunch made, and pyjamas waiting for me. Weekends are a mix of relaxation and frantic activity these days. I had a luxurious bath while reading a new library book, something I hadn't done for months. 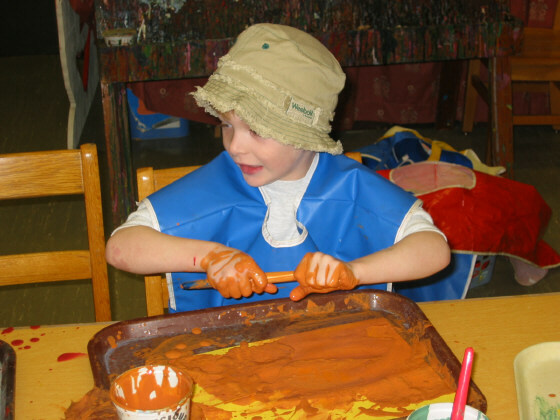 We also had an assortment of house projects, park runs, preschool meetings, bread making, dinner guests, lots of laundry, and computer playing. The remodel is coming along fairly well. We've got most of the electrical work done. People start hanging sheetrock next week and Jim's coming to paint towards the end of the week. Hopefully we'll have things ready for Thanksgiving weekend so we can paint endlessly. As for the highlights of the weekend, Sam and I made really good bread together. We also went to the park and found that someone had dumped some snow in a big pile. Sadie called and we chatted while I carried Emma about. Emma's learning to slowly scoot herself short distances on her belly. For the last couple weeks, my computer's been acting a little funny. After my computer was on for awhile, it would start display strange video artifacts, such as sparkles or weird geometry. Eventually it would lock up, frustrating me greatly. After fiddling with drivers and such, I finally opened up the case and saw to my surprise that the video card fan wasn't running. I broke out a case fan, screwed it into the heat sink, and it's been working just fine since then. I had a hot shower this morning, a significant luxury after the last few days. The ride to work was also stunningly beautiful, with the sunrise matching the leaves on the trees quite nicely. It looks like I won't be painting this weekend, as Jim's coming down from Portland to do just that. That leaves us with few remodel projects in the short run. The electrician continues to work today and tomorrow. I think we'll do a library run and perhaps go shopping for Sam's birthday. A very windy day in Northampton, causing the wind to whistle through our seventy-plus year old windows. They promise we'll get new ones in a month, but for now its sweaters indoors for us. Nevertheless, the sun is brilliant, as it tends to be on sickeningly cold days, so I'm feeling quite cheery. big hugs. The great plumbing issue has been resolved. It turns out the plumber hooked up the fixture upside down, causing the hot and cold water to mix. I think we'll be passing along the bill from our hot water heater maintenance guy to the plumbers. I had a warmer shower this morning, though still not quite as tosty as I would have liked. The plumber came back, poked at things a bit, then told us to call the people who service our natural gas-powered heater. That guy asked at once if we'd installed any new fixtures. Evidently there are issues where they can cause cold and hot to mix together at the fixture, causing our problem. I think we'll be calling the plumber again to tell them that. In the meantime, I cranked up the hot water to 140 degrees so that we can at least get warm enough water to bath kids and take a shower. Ah, the joys of home ownership. The electrician was over yesterday. He was looking skeptical about turning the sauna power into an outlet. I told him to bag the whole thing and I'll just run a power strip through the wall for my computers. Sigh. The week chugs along. We signed a million papers last night for our new home loan. It's not a great new rate, but there were no closing costs, which is nice. 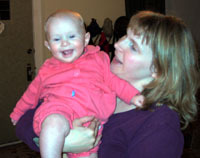 Jamie and I are knee-deep in parenthood these days, a dazed look continually plastered across our faces. Thank you to all for making my birthday so wonderful! I took a cold shower this morning, though perhaps not for the reasons you expect. We had the plumbers over yesterday, replacing the bathroom pipes and fixing a toilet. Unfortunately, my guess is that they did something to turn down the temperature of the hot water, though we can't figure out how they did it. The reading on the hot water heater (which is gas powered) reads 114 as it should. So, we'll call them over today to see if they can get it back to normal. The kids were a bit much last night. Emma was quite grumpy, crying all through dinner and much of the night. Once again, AC/DC put her right to sleep when all other recourse was taken. I haven't done a little games update for awhile. I finished Halo, which was a fun little thing. I'm holding off on Max Payne 2, which I hear is extremely short. 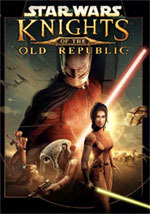 In another week, Knights of the Old Republic is arriving and I think Sam and I will be playing a lot of that. Sam's been getting into adventure games, so we played "Sam and Max Hit the Road" over the weekend. He liked it quite a bit and we've started in on Monkey Island. Great fun. What a weekend. I lost track of all the laundry I did, probably somewhere around twelve loads. We didn't have any use of our washer and dryer for awhile, so it had been awhile since we ran it. Both days I was going up and down the stairs with laundry baskets, folding endlessly. Overall, though, it was pretty good. Jamie and the kids all seemed in good spirits. Sam and I tried to get out of the house for at least part of it, including a cold trip to the park and a long hike on Rigeline trail. We also watched Finding Nemo, which I had never seen and enjoyed quite a bit. Sunday we had a birthday party for Seraph, which was fun. Having all the kids arrive was a bit crazy towards the end. We walked home and Jamie's uncle Darrel arrived for a quick visit. We'll see what remodel wonders await me on my return home. Supposedly we'll have the electrical work started in on. Ah, the weekend. No plan really, other than laundry and entertaining children. The tile guy is coming again today to regrout the upstairs bathroom. The downstairs shower was fixed as well yesterday. It turns out our plumbing problem was due to a leaky shower head which would have been quite easy to fix. Now we're going ahead and replacing all the pipes since we tore out the wall. Sigh. Most of the carpentry is done in the basement. Monday the electrician starts. Hopefully I can get him to do the funky stuff to support my computer projects. It'll be nice when this is all finished. Emma continues to grow like a bean sprout. She finished up her first box of rice cereal and started in on the oatmeal. So far, so good. She gets a frantic face and starts opening her mouth every time the spoon appears. She also made Jamie's day yesterday. Emma was practicing different sounds and she ended up saying "mama". She also did "baba" and a weird spitting noise. When life gets busy, it's the simple things like a warm cafe mocha on a cold morning that make life good. The construction project continues on. We have walls now, or at least the frame where walls will be. It helps give a sense of space, providing a better feel for how big things will really be. There's also those last minute descisions and details that need to be decided upon. I think we'll leave the bottom of the stairs alone, for example, instead of having them go straight down they'll keep their curve. The main plan for the weekend is to do a bunch of laundry. The water is hooked up, so we should have some opportunities to get some cleaning done. They've been piling up for quite awhile now. Thursday already. It wasn't nearly as dreary this morning when riding my bike to work. The last couple days have been cold and wet indeed. The construction in our basement continues. We now have floors you can walk on and the walls are mostly framed. The electrician is supposedly coming in tomorrow or Monday to do his part. We also started finally fixing the plumbing on the main floor bathroom. Tiles were removed by the tile guy, we're getting someone else to open up the wall this morning, and later today the plumber comes to fix the pipes. It's quite the hassle to organize all the different people and Jamie has done a great job. I had the kids all by myself last night while Jamie went off to a preschool meeting. Though I dreaded the worst, it actually went fairly well. By the time Jamie returned, both kids were snoozing away. It's after 8:00 pm and I'm still at the office. I've been trying hard to get caught up with the personal paperwork which slid to the back burner. I haven't really kept up with getting stuff into Quicken, and doing taxes is about ten times easier if I do. Sadie and I had a good long talk last night. She is talking about a red-eye on Christmas Eve. She had been doing a satisfaction survey in her internship of the reaction of some older home owners who received grant money to have home repairs done. She sounded as though it had been fun. The remodel is well underway. Yesterday they measured and framed out the floor. 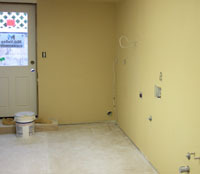 Today we have an insulated floor as well as the plumbling for the sink and washer and dryer. Plus, the tile person came to take off the tiles in the upstairs bedroom (which has the leak). Jamie's been amazing, organizing all these people and companies. I started getting sick yesterday and find myself quite sniffly. Work was pretty hectic too, as I had to make up for taking off Monday. 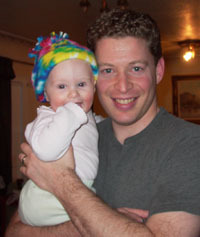 Despite it all, the kids seem relatively happy and healthy, though Jamie and I are clearly pretty beat. Oh, and if anyone is browsing magazines at the supermarket, take a look at Computer Gaming World and turn to page 108. I'm mentioned there for my Neverwinter Nights projects. Pretty neat. Sam and I discovered a new game this evening - the Time Travel game. In it, Sam goes into the future or back to the past to visit various people and places. Tonight, he went back to talk to me when I was a kid and back to visit Jamie as a baby. He said some hysterical things when I was trying to explain video games of the 70's to him. I was going into Pong and lines and bouncing dots when he replied, "in the future, video games make sense." He also traveled to the future and it turns out the dinosaurs were around and had stomped the cities to dirt. I asked how they got there and he told me that they had just been hiding in caves. For some reason, that made me laugh out loud. It's been a relatively quiet day, though the kids appear to have caught the cold. Emma's been hit the worst, having a hard time sleeping with all the sniffling and sneezing. Sam has a touch of it too, though it's not too bad. Jamie went off to visit with Angie this morning, leaving me to fend for myself. Fortunately both kids were pretty good. After her return, we've puttered around. 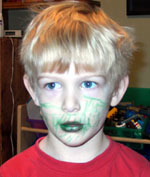 Sam wanted to be an orc, so he applied his own makeup for the situation. When we decided to make bread this afternoon, he agreed to help as long as I called the ingredients things like "powdered elf toes" and the like. Yea, well, 20 percent of nothin' is NOTHIN'! I've resorted to playing loud music to put Emma to sleep tonight. She has a cold and the runny nose is bothering her. Fortunately, a little AC/DC put her right to sleep. As a bonus, Sam thought it was such a nice little ditty that he asked me to play it again. Dirty deeds, done dirt cheap. Well, Jamie never posts here, so I'm taking matters into my own hand and doing it for her. Jamie's been pulling extra-mom duty these days, taking care of both kids and all the remodel projects going on these days. I keep wanting to offer her a raise, but she so far has refused. Sam continues to grow in leaps and bounds. He's currently sitting on the floor next to me, practicing his drumming. 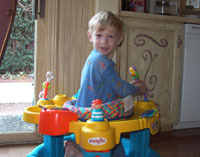 A bit before that, he was spelling things with Tinkertoys. I think me managed to spell "Tail Hi Air". I periodically forget he's still only four as we can carry on an adult conversation fairly easily. He also has a good memory and comes up with clever things quite often. I'm very proud of him. Halloween went well. Sam donned his skeleton outfit and we went out into the neighborhood to seek our candy glory. It was freezing cold and so we only made it to a few houses before we turned back again. After dinner, we drove over to my mom's house to show off the outfit. Then it was back home to greet trick or treaters. Sam was our official candy giver. For a long time, there wasn't really any people showing up, but then we started getting big groups around 7 pm. Sam and I watched various Halloween specials while we listened for the telltale chatter of kids seeking candy. Finally around 8 pm we closed up shop and all went to bed. We're going to try and clean out the garage today, moving things under the porch area. I think my dad's coming over to help, which would be very handy.